Thank you to Ms Mazumder and everyone at this lovely school. Having not had time to recover fully from our manic (in the nicest possible way) trip to Jersey, it was with some trepidation I headed up to the Wirral. 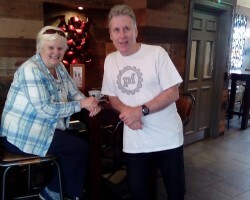 Kath did not accompany me on this occasion as she opted to stay home and help out with grandchild (William) commitments. No need to worry…the staff and pupils really looked after me during my two-day visit. One of my keenest fans, Francis, was waiting to greet me and acquire the only book of mine he didn’t have – PS13. The other pupils in KS2 were just as keen and after presenting my scariest trilogy of books, KRUSCHMEISTER, SCABBAJACK and TEN O’ CLOCK CALLER, they were all waiting on the final morning to get their hands on the books and have them signed. In fact I almost ran out of books! Due to the long signing, I didn’t get onto the road back (the dreaded M6) until later than expected and it was a long and tiring drive back to restful, rural Berkshire – but definitely worth the effort. Thanks again, Redcourt St Anselms; hope you thoroughly enjoy the books. And after our great workshops working together, I look forward to hearing about your very own spooky, scary stories. We arrived in the Channel Isles! It seemed a long way from Rotherham, but at least we knew that if the schools in Jersey were anywhere near as good as Roughwood, Herringthorpe and Greasbrough Juniors back in Yorkshire, then we were in for a real treat! And our final two schools in the South and South East of the UK, Mile Oak Primary near Brighton, and St Joseph’s RC Primary in Northfleet, Kent, also set VERY high benchmarks for the Jersey schools to follow. We really have been enjoying a wonderful time at the moment visiting so many fabulous UK schools and we are truly grateful. Well, we arrived in Jersey and checked into the Hotel De Normandie, right by the sea, and after a rainy start the weather finally brghtened up. It also brightened up for the Queen’s huge street party back in the Mall, in celebration of her 90th birthday. We watched it on TV and it looked great…a real credit to her. The first two days were spent at Le Rocquier…the biggest state school on Jersey…and what a great school! The wonderful librarian, Mrs Moi Mabbs, looked after us like royalty. Who needs a knighthood when Moi’s around! She had everything organised beautifully and within two days we had entertained and enthused over 400 willing students – 200+ KS2 pupils from a number of brilliant feeder primary schools, and the second day spent with loads of Years 7 and 8’s – all an absolute pleasure to work with. A MASSIVE ‘thank you’ to everyone at Le Rocquier for looking after us so well and making Kath and I feel so welcome. And especially a HUGE ‘thank you’ to Moi. Tuesday evening was spent in the eatery across from our hotel, the White Horse. afternoon, we spoke to the Jersey Library Book Club children, and again they were a joy to talk to…and to entertain! What a great time we had. 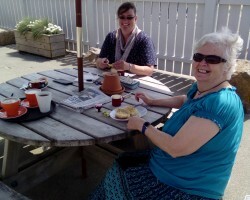 Ms Bithell took Kath and I on a little tour of the island the next day – with a short but hectic visit to yet another brilliant school, Les Quennevais (BIG ‘thank you’ to Mr Lopez and pupils), and during our tour, Ms Bithell treated us to a Jersey cream tea. WOW! It was superb! Jerseylicious! Jersey really is the most beautiful of locations, especially when the sun is shining. 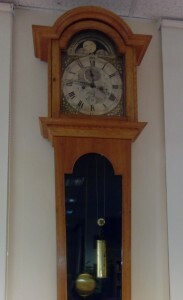 Caller’ grandfather clock spookily placed in the library (see pic). I’m just relieved we didn’t stay behind until the dreaded 10pm – there were lots of stairs around for footsteps to sound on! I would like to finish off this blog by saying that the organisation on our behalf was quite remarkable. The librarians were nothing short of A-MAZING and Kath and I will never be able to thank Moi, Cathy and Anne enough! Never has such a hectic schedule been so stress-free. I just hope the schools and libraries value their effort and enthusiasm for all things literary. We are already planning to return, but this time with our cute little boy in tow – Simon (not cute really!). Watch out Jersey, the Murray’s are invading – let the nightmares begin! 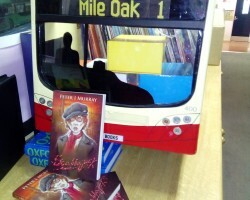 What is your favourite Peter J Murray book? Peter is the author of the 'Mokee Joe' series and three other popular horror fiction titles 'Bonebreaker', 'Dawn Demons' and 'Moonwailer'. His seventh book 'ScabbaJack' was released in 2010 and is going down a storm with fans new and old. He lives in Yorkshire with his wife.